It’s amazing how our emotions can drive our thinking. Grant was my soul mate and I’d never be happy with anyone else. That’s how I interpreted the reading by Lama Sing through Al Miner. But we’d both apparently screwed up in some way. Until Grant unburdened his karmic debt, there was no hope for our life together. And I needed to learn to express my emotions honestly, so I read “When I Say No, I Feel Guilty,” and “Your Erroneous Zones,” trying to find the key to unlock the secret self, to activate Lama Sing’s principle: “…As it is beneficial to you, so is it given.” I needed to really work on myself to make it “good for me” to have Grant in my life! Never mind that it would have been pretty clear to anybody else (and was) that he wasn’t, and never would be, good for me. Of course, I mailed the reading to Grant to provide impetus for his own transformation. If we both just stayed away from each other, and worked on “clearing away the clouds,” everything would soon be right for our “destined” love to manifest fully. Until then, I had visions of noble sacrifice and suffering. As Lama Sing noted, I sought only that One with whom I could share All. Nothing less would do. He had to be Polish, and Grant was, and there had to be a connection to WW II, and Grant had that through his father, so it was all clear! 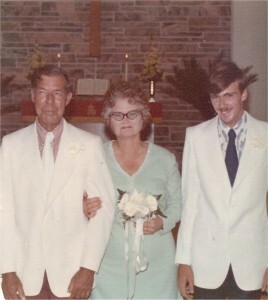 Mom, at 52, with her sixth husband, on her wedding day. My brother is at the right. The first Christmas of my life without my grandfather came with no celebration. I’d avoided any real interaction with my mother’s husband because he annoyed the heck out of me. When he was home, I stayed in my room reading or went out with Eva. Now he was constantly present and we faced a family sit-down dinner together. Everything about Christmas reminded me of my grandfather. He had always made Christmas fun for us. I think he loved playing Santa, an “alter ego” who didn’t have to be serious and gruff all the time. On this Christmas I felt a building tension of agonizing grief and irritation at the presence of this pusillanimous man in my grandfather’s house, posing as the “man of the house”. If Buck had been at all competent in any way, it might have been endurable. But, to put it plainly, he was an idiot. I wondered how he managed to dress and feed himself, much less keep a job as a building contractor. What my mother saw in him was a mystery. But he was probably physically attentive and a faithful dog at her heels, all she required as an ageing belle. We sat down for dinner. It was the first time in my life I had ever eaten a turkey that had not been cooked by my grandfather. Even if every other part of the holiday feasts were in the hands of the women, Grandpa always did the turkey: his specialty. Every dish on the table was part of family custom, the foods my grandfather liked. Buck sat in my grandfather’s chair at the head of the table. I didn’t look up from my plate. Tears silently dripped onto my hands. I mumbled responses to overly cheerful queries or to pass a serving dish, and avoided lifting my eyes. I didn’t want any pity at our family Christmas dinner. I knew that I couldn’t eat a single bite, but I didn’t want to upset my grandmother, so I pushed my food around a bit to seem interested. Meanwhile, the conversation had taken an unseemly turn. Well, fine, you old bore. Go for it. Right there I froze. What was he talking about? “Not any more!” I said. I stood up so fast my chair tipped over backwards. I wanted to pick up my plate and throw it in her face, but managed to restrain myself. I got my bag and keys and was out the door. After a few hours at the riverside park, I went back home. Mother gave me the silent treatment with frozen hate in her eyes. Buck was nowhere to be seen. Grandma came to talk to me while I packed. We sat on the bed and held each other and wept. I felt it too, but I didn’t have enough confidence in myself to take action. When we were growing up, my brother had a favorite sibling insult. He liked to tell me, “For somebody who’s supposed to be so smart, you sure are dumb.” Well, sometimes it seemed to be true. Being a smart person who did dumb things was the self-fulfilling self-image that grew in me primarily as a result of my mother’s projections. Because of her own feelings of rejection, which were decisions she had made about herself as a small child, she had no internal values of self esteem at all. This is intolerable to the psyche. When one part of the mind is convinced there is nothing about the self to love, there seems to be another part, fueled by the need to be loved, that builds walls against any criticism. In recent years, after reading the book “Trapped in the Mirror” by Elan Goulomb, I finally began to understand the dynamic with my mother. Mother was a narcissist who had become one in self-defense. That’s rather different from someone with NPD, but just as problematical. She had created a disguise, a false self who was never wrong. In a sense, this false self was like the Queen in the story of Snow White: “Mirror, mirror on the wall, who’s the fairest of them all?” And her mirror always told her: “You are.” The emotional “food” for a narcissist is admiration and approval. But this creates an almost impossible inner conflict because the part of the self convinced that it is unlovable simply must act in ways that generate rejection in order to be “right”. The part of the self that needs continuous approval must get it by any means necessary. The narcissist solves her dilemma by subterfuge and enormous trickery and deception. The part of self that drives her to perform badly must be “made right,” to blame all the “failures” on someone “out there”. This is essential, because to admit to one failing, to acknowledge a mistake, even a simple human error of judgment, would be to open the door to the deep internal lack within. Such feelings of worthlessness are like an ocean being held back by a fragile dyke. The illusion of perfection, maintained by projecting faults onto someone else, is a barrier to be constantly tended, mended and shored up. To admit any feelings of deficiency would be the equivalent of poking a hole in the dyke, an event to be feared as a total disaster. To disagree with Mother was equivalent to striking her carefully constructed shell of grandiose fantasies about her own perfection. Any opposition to her views could plunge her into a black hole of inconceivable emptiness, jealousy and rage generated by this fear of the breaching of the dyke. Anyone who tried to breach the shield had to be extinguished. Because her entire perception of the world was organized to deny her own feelings of worthlessness, she needed to force others to go along with her views. In her deepest self, she felt her ultimate survival depended on this. People who live with narcissists have no other choice but to agree. I became Snow White in this archetypal drama – the sin bearer. Not that I was beautiful or had Snow White’s attributes. I was the mirror that kept suggesting there was some imperfection in the Queen. I became the threat to the carefully constructed and maintained dyke that held back the ocean of unworthiness that had been created in my mother as a consequence of the death-abandonment she suffered as a child when her beloved Mama was murdered. As long as I “lived,” the mirror kept pointing out that the Queen was not the fairest of them all. In this way, Mother projected onto others the blame for anything that went wrong in her own life. If I had realized the true state of affairs at the time, perhaps I would not have resisted her so vigorously, keeping myself in a constant stew, or regularly turning up the heat on the hot water I was in. Any move toward a separate identity was treated as betrayal, and I was made to feel that my seeking independence would “kill” her. And, above all things, I did not want to kill my mother! Mother wanted my constant adoration and approval, a carbon copy of her illusory self-image. 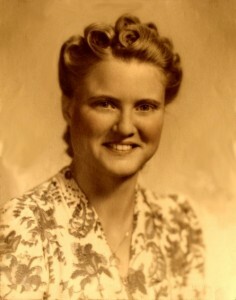 My mother in her twenties. She had certainly been a beauty, a potential sister to Ingrid Bergman or Grace Kelly. She had a fine figure, good teeth, and great hair. She was a marvelous dancer, social, outgoing. She craved action and excitement. I was plain, pudgy, had crooked teeth, two left feet, and liked nothing better than to be left alone with a good book. When I was four or five, and still blonde and “cute,” she spent time dressing me up and showing me off. When I turned six or seven, and began to morph into myself, I became her supreme disappointment. She magnified and commented on every imperfection with fiendish frequency. I struggled against her projections throughout my childhood and adolescence. This is at least a testimony to my will. But I still felt bad, wrong and confused. After all, Mother had to be right, didn’t she? I was damned if I did, and damned if I didn’t. My brother caught on to the game more quickly than I did and became the “mirror” of perfection in her eyes, feeding her with approval and assisting her in crushing any resistance in me that made the mirror suggest she might not be perfect. Like the woodsman who took Snow White into the forest, my brother lacked the courage either to deny the Queen’s wish or to do the wicked act of murder. He would figuratively take me to the psychological woods and abandon me, but he wasn’t cruel in a deadly sense. He participated in this process by duplicating my mother’s views of me. He learned to suppress any doubts that Mother was right, and even his own perceptions, because he knew that to get along, he must agree with her in all things. I can’t say I blamed him; he was sensitive and didn’t like upsets, so it was easier for him to just go along and get along. Above all, the child of the narcissist is trained to be giving, to not be selfish, to be a “mirror” of the Queen. On those occasions when his needs become internally demanding, he follows his usual path of taking Snow White to the forest and leaving her there, returning with the heart of a pig in a box. Deception is his mode of survival. But, I wasn’t made that way. I was constantly at war with what I perceived as wrong. Conditional love hung like a pall over my environment. In every instance of self-expression as a child, I was rejected by my mother – abandoned – as her own childhood wounds were transferred to me. The death of her beloved grandmother and the cruel demands of her parents were crimes against her essential self. She was not accepted as herself, so she could not accept me. Because I was also her only girl child, she identified with me more strongly, was more demanding of me, and consequently more deformation was assigned to me as the scapegoat. Every day I was evaluated and found lacking. I came to believe there was no support for my inner self, no right to exist as myself. Hopeless and paralyzed, I sought refuge in the only port I could see in the storm. It was years before I was able to begin the work to undo the illusions under which I was brought up, and which were part of my experiences in the “real” world. The pressure from my mother to conform to her “labels” and expectations was like an invisible force in my life, so uniform and relentless and omnipresent that I was hardly aware of it. Like a fish in polluted water, I was able to survive, but only barely. It is difficult to confront such painful experiences in which I was as guilty as any other participant. Sadly, until I woke up, I did the same with my own children! I recently bought a book called “Toxic Parents”. In the first chapter the author blames parents for all the toxicity of a person’s life. Parents are to be confronted and held responsible for the results of their actions. I closed the book right at that point and returned it to the store and got my money back. That is about the most ignorant and useless advice I have ever read. Anybody in a similar situation knows what I mean. Confrontation and attempts to engage in dialogue, unless both parties have achieved some self-awareness, can only perpetuate the dynamic of the child trying one more futile time to get love, and being rejected one more futile time. I am not blaming here. I do not believe that my mother was responsible or aware of the damage she created in our lives. She was like a broken porcelain doll with shattered perceptions of the world around her. The burden of awareness is on me. Any blame can be directed at the social and cultural systems that give rise to the false beliefs holding us captive. If I blame my mother for what was done to me, shall my own children not find it necessary to blame me for what I have done to them out of my own wounds and illusions? And then, what shall their children do? And their children’s children? A child who is told that “for being so smart, you sure are dumb,” over and over again, will inevitably fulfill that prophecy. Such lack of faith in the intrinsic self puts intolerable pressure on the person to conform to this expectation by acting out “submission” to the wishes of the parent. And those wishes are for the child to be the scapegoat, the bearer of the sins of the parent, the one who is unloved, the one who fails, the one who screws up and who is to blame for every negative occurrence. As a female with intelligence, I was being programmed to screw up, and screw up royally. In retrospect, I realize that I was also programmed to be manipulated by authority figures, and to fall prey to seduction where love was promised for surrender. I found myself repeatedly involved with friends who needed my uncritical acceptance. My role was the supplicant at their feet, listening in rapt awe, while nothing I said was ever heard. It was my job to laugh, but never to tell the joke. I called but was seldom called in return. I arranged my life around the schedules of others. I was compelled to win Mother’s love vicariously from other people. Naturally, many were narcissists. I was unable to put any need of my own at the top of the list. That was selfish. Love meant giving without resentment, competitiveness, or jealousy. Young women in our society were trained to believe the only way to be loved was to give love, to make others happy by surrendering our selves, our ideas, our values, our goals and objectives, and even our very thoughts. The only way we knew how to get love was to give up ourselves completely. The idea of intelligence as a “useless” commodity was almost a tenet of the Christianity of my childhood. Brains would get you nowhere if you weren’t “saved”. It was a waste of time to read any book except the Bible, because all anyone needed to know was right there. Additionally, I was a girl. I was doubly damned, and disaster was sure to follow. Grandmother and I both knew I was not going to be able to keep my mouth shut around Buck and Mother. Neither of us could deal with Mother when she was “with a man,” as Grandma put it. Grandma gave me what cash she had to tide me over and I left for the Farm. The time warp quality of the Farm seemed to have intensified. All the memories of my stand-off with God flooded back within hours of my arrival. I went about getting settled, putting fresh linens on the bed, hauling in water and all the usual tasks of opening up the house. But for some reason, the unearthly silence of the place unnerved me. Everywhere I looked there were memories with a new meaning now. I looked over the land and realized, with full import, that I would never again see a garden of my grandfather’s making there. I wandered through the house and saw everything organized according to his design and purpose, and I knew that the mind behind that purpose was now absent from this world. How fleeting it all was. The few happy moments of my childhood were mostly memories of days at the Farm. I looked back over them, like a collection of photographs in a box, and saw how small the ratio of happiness. Memories of my year with Grant descended on me in full force. I had been at the Farm for a couple days when I decided I wanted some fresh fish to eat. I drove down to the little fish market we’d patronized for years when we wanted fish other than the kinds we could catch off the bank. I was surprised to discover that it had changed hands. A friendly, stylish blonde woman named Myrna stood behind the counter. We exchanged pleasantries. Her husband was retired from the Air Force and they had bought the fish house and a shrimp boat, trying their hands at living out their retirement “dream”. I commented that I would love to buy some shrimp, but unless I found a job locally, which wasn’t very likely, I would have to go back to Tampa as soon as I ran out of money. She wanted to know where I lived. I told her we owned the old Farm a few miles up the road. She had passed the house and wondered who owned such a terrific old place. A few days later, Myrna drove up to the house in her snazzy convertible and waved at me sitting on the porch. “I have a proposal for you,” she hollered as she got out of the car. “I know it’s not like a real job or anything, but Rob’s helper quit, and we need somebody to go out on the boat with us. You don’t suppose you’d be interested in a low paid but interesting job on a shrimp boat? You get to take home all the shrimp you can eat, too!” Her enthusiasm was hard to resist even in my state of abyssal melancholy. Work on a shrimp boat? Well, heck! Why not? Out on the Gulf of Mexico at night, a stiff sea breeze blowing salt spray from the prow of the chugging little shrimp boat back on Myrna and me, working in the bright lights on deck, it seemed like being in a different world. Myrna and I talked non-stop while we picked and sorted shrimp from the big net bags her husband Bobby regularly dumped on the wooden tray in front of us. It was hard work, but in retrospect we had a lot of fun. Myrna was interested in metaphysical subjects, and her latest idea was to experiment with miniature pyramids. We bought big sheets of heavy poster board in different colors and followed the instructions to make a bunch of little pyramids. I took mine home and carefully aligned them under the bed and on various tables around the house. I also began to practice meditating with a little pyramid perched on top of my head. I’m sure I looked perfectly silly, but I really did feel an enhanced energy flow. Their experiment in living the “retirement dream” of owning a commercial fishing boat was not turning out well. Myrna and Bobby had given it a specified period to prove a worthwhile occupation, but the time was up with negative results. They decided to move back where they came from. There was now no one to talk to but God. I was soon out of money and down to canned food and instant coffee, but I was unwilling to give up my plan. I decided to make my supplies last longer by extended periods of fasting. The grounds of the Farm also needed a lot of attention, and since my grandfather would never again be there to oversee the work, I decided that the responsibility was now mine. I established a meditation and work schedule. I mowed, trimmed trees and shrubs, cut fallen limbs into firewood, and cleared several acres of high, thick weeds and volunteer tree saplings by hand that we normally hired a man with a tractor to handle. It was grueling labor. I stopped only for water and pushed on till dark. Day after day I worked, pleading with God for understanding. I spent hours in various meditation postures. I focused, concentrated, repeated mantras, cried, emptied my mind, and mostly, I simply waited and listened. Perhaps, in some unknown way I didn’t understand, I belonged to the creature that appeared as the Face in the Window of my childhood. Such a thought was insupportable. Again, I saw no way out. This time nothing would go wrong. Practically no one knew where I was, and most certainly, no one had been to visit me for several weeks. I found a long piece of flexible rubber hose, much larger than a water hose, and affixed it with a clamp to the exhaust of my car. Methodically, I arranged the mechanism of my release. When I was finished, I examined my handiwork and was satisfied. What to do now? “Well, let me have just one last cigarette,” I thought. And I sat on the steps of the back porch. One cigarette, and that was it. It was the strangest cigarette I ever smoked. The first couple of puffs hit me like a ton of bricks. I was suddenly unable to keep my head erect or my eyes open. I struggled against this feeling of overwhelming sleepiness without success. I thought briefly about just getting into the car for my nap, but found my limbs heavy as lead. I could not even get up. I simply stretched out right there on the porch in the sun and fell asleep as suddenly as if I’d been drugged. The next thing I knew, a horn sounded. I struggled out of a deep abyss of sleep in confusion and puzzlement about that crazy noise. Eva was racing up the driveway, honking her horn as she came. So it seemed that even under the most ideal circumstances to accomplish the deed, I couldn’t put a period to my own existence. Somebody was watching out for me and was strangely able to exert some influence in the world of matter. Either that, or it was my own inner self. It was hard to say, but it was equally hard to ignore the implications.